I wish I’d thought of that… O wait, I did. Well I just thought of one, and since I’m in a charitable mood, I’m going to offer it free of charge to anyone out there looking for a business idea. I’ve been listening to the grumbling classes on various radio shows explaining to Joe Duffy and Pat Kenny how the new requirement that they carry their driving licence while driving is a terrible inconvenience. It boils down to a discrepancy between the size of the licence and the size of the wee pockets in wallets for holding credit cards. Licences in other countries (the American licence for instance) are credit card sized, and so fit easily in your wallet. 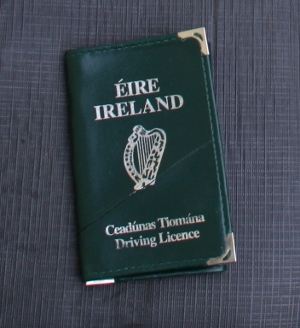 Irish licences are too big and bulky though, and no one wants to leave the licence in the glove compartment all the time in case it gets stolen. It seems to me there’s a simple solution. Someone is going to make a fortune out there. All they have to do is get a licence wallet on the market. Luxury ones in leather, cheap ones in plastic, customised ones with a Man U or Westlife logo on the cover, His’n’Hers for Valentine’s Day. The possibilities are endless. So to any budding entrepreneur out there, don’t mention it, the idea is free and I haven’t patented it. Just get a move on with it, before Seamus Brennan decides to redesign the driving licence in a convenient credit card size. It’s a winner I tell you.